Shamballa: The spiritual planetary capital and the abode of the Lord of the World in the subtle dimensions of the universe. 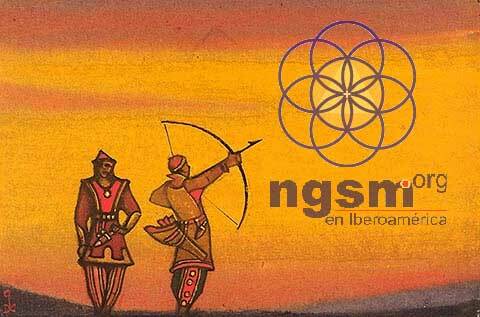 NGSM.org: A nucleus of the New Group of World Servers inspired by the life and work of Vicente Beltrán-Anglada (VBA). the Service to Humanity through White MAGIC, organized throughout the whole planet. 1875-1925: First Stage (Helena P. Blavatsky). The Revelation of the Secret Doctrine: Cosmogenesis and Anthropogenesis. 1925: Foundation of the New Group of World Servers. This group mediates between the planetary spiritual Hierarchy - the spiritual government of the world - and Humanity. 1925-1975: Second Stage (Alice A. Bailey). The Revelation of the Psychological Key of the Secret Doctrine: the Purpose of the Lord of the World and the Plan of the planetary spiritual Hierarchy. This Plan of Love and Light seeks to implement the Divine Purpose on Earth, with the full, free and informed consent of Humanity. 1975-2025: Stage of the Forerunner. This stage precedes the externalization of the Hierarchy, as part of the Plan. The lessons learned during the World War (1914-1945) must be applied by Humanity and the New Group of World Servers to promote right human relations leading to the minimum peace necessary to avoid another world war. Such a conflict would represent the end of life on Earth. 2025: Conclave of the planetary spiritual Hierarchy. As part of the Plan, in 2025 the schedule for the externalization of certain Ashrams of the Hierarchy of Masters of Compassion and Wisdom will be reviewed. Also to be considered are the preparations for the imminent return of the World Teacher - head of the Hierarchy, Lord Maitreya, known in the West as the Christ - in the physical world of human affairs. 2000-2020: VBA Study Center. This Center is a spiritual community dedicated to honoring the life and work of Vicente Beltrán-Anglada through meditation, study and service related to: i) the praxis of Agni Yoga, leading to Shamballa; Ii) the collaboration between the human and deva kingdoms; and iii) white magic, organized and planetary. 2020-2040: Triangles Radio. This virtual radio intends to reproduce the telepathic communication in the Ashrams of the Hierarchy. An Ashram is a laboratory of research and development where ideas are conceived and developed into ideals, in order to restore the Plan of the spiritual Hierarchy on Earth, according to the Will of God and fulfilling the Purpose of the Lord of the World. White Magic (Theurgy) begins with the Science of INVOCATION. It is organized through networks of TRIANGLES, nurtured in the practice of Goodwill, at the individual and planetary level. On an individual level , White Magic invokes contact with the center of consciousness called the SOUL. From that center of consciousness LIFE streams into the human being. Through the activation and geometric (triangular) alignment of other subsidiary energy centers that exist in the human frame, White Magic produces mental, emotional and physical health. When the LIFE of the Soul flows unobstructed in the human being, the perfect health of the good will is attained. At a planetary level, individuals who have awakened to their spiritual reality are organized, naturally and spontaneously, according to the Plan of the planetary spiritual Hierarchy. This Plan of Love and Light seeks to implement the Divine Purpose on Earth. The Will-to-Good is expressed as Good Will in the seven fields of service, fully sharing light, love and life according to need, human and planetary.